Having previously been somewhat dismissive of Clarins' skincare, I've been completely converted and now can't get enough of the products. 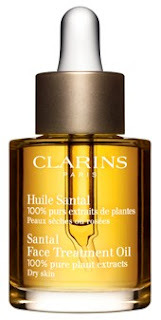 I'm currently rather obsessed with the new Clarins Santal Face Treatment Oil which is designed to treat dry skin. If you're yet to discover face oils, you may think that they'll be greasy and will clog your pores. It's time to put aside those preconceptions- they won't and are suitable even if you have oily skin (in fact, oil helps to treat oily skin). Whether you're looking to try a face oil for the first time, or are already a fan, Clarins Santal Face Treatment Oil is a good option. Presented in a small bottle with pipette dispenser, it's easy to control how much you use. A little goes a long way and I found that I only needed a couple of drops to nourish my face. The oil feels velvety to apply. It's not heavy on the skin and is easily absorbed. As with all oils, I found that the texture encouraged facial massage. Cardomom is the predominant scent which won't be to everyone's liking but I personally found the exotic fragrance pleasant. As the name suggests, Clarins Santal Face Treatment Oil also contains sandalwood along with lavender essential oils. Since incorporating Clarins Santal Face Treatment Oil into my routine, my skin has felt softer and more conditioned. I've found the oil to be very soothing, it promotes healing and helps reduce redness. At £29 for 30ml, I find this reasonably priced and highly recommend it. I love Liz Earles superskin, have you tried that? I was wondering how these compare. Thank you for your comments. I'm afraid that haven't tried the Liz Earle superskin- I always want to like her products but don't tend to be wowed by them. I really can't get enough of Clarins at the moment!